Each tequila has its own “flavor fingerprint,” and each person has his or her own flavor preferences. Tequila Matchmaker‘s proprietary matching algorithm uses nine different characteristics to find the best matches for you based upon the reviews you do of the tequilas you drink. The Matchmaker app it gets smarter the more you use it. 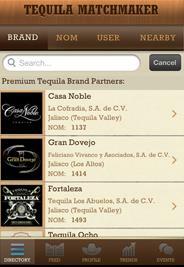 Click here to download the app today – it’s free – and let the Tequila Matchmaker figure out your own flavor preferences, then check back here at Tequila Aficionado for our reviews and recommendations. Tequila Aficionado is not affiliated with Tequila Matchmaker or its creators at www.TasteTequila.com. Our promotion of the Tequila Matchmaker app is solely to provide additional options for aficionados to connect with the greater tequila loving community. We do not receive any compensation in cash or in kind for any promotion of this product.